ZUKUNASISTERS is a truly-one-of-a-kind Japanese female soul band consisting ofthree amazing performers: emi, spicy-marico and Akane. Having been strongly influenced by black music, ZUKUNASISTERS fashions an amalgam of 60’s to 70’s R&B, soul, and gospel. The band’s unmistakable flavour and dramatic chorus work is indeed the product of members’ undeniable chemistry. Emi’s singing which is often referred to as Etta James and Tina Turner, and the band’s tireless energy and vibes inflame and thrill the audience – the performance you will never forget. 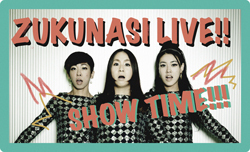 ZUKUNASISTERS was formed in 2002 whenthe original four members first met in the music club in university. Since then, the band has been receiving tremendous supports from numerous musicians, recording engineers and event organisers, and it has been tirelessly playing live shows in night clubs, music festivals and local events throughout Japan. ZUKUNASISTERS has appeared in a number of Japanese music festivals including FUJI ROCK FESTIVAL (2006, 2009, 2014), SUNSET LIVE (2006, 2014), ARABAKI ROCK FESTIVAL (2009), WINDBLOW (2012, 2014), EARTHDAY TOKYO (2009). The band’s self-organised live events “SOULBOOK” have won great popularity among fellow musicians regardless of age and musical background. In 2007 ZUKUNASISTERS found a self-label “ZUKU74RECORDS”, and released the band’s first full length album “SOKONASHI” the following year. In July 2010, released was the band’s second studio album “FOR YOU”, which was entirely recorded in the basement of the member’s parent’s house. Recorded in the basement studio where the band had countless rehearsals, FOR YOU filled with the band’s raw sound, has become a significant milestone for ZUKUNASISTERS as soul band. In 2011 the four girls fully prepared for the upcoming US tour, decided on calling themselves ZUKUNASISTERS to identify themselves in overseas markets, while keeping “ZUKUNASI” strictly for the Japanese market. And then in March 2011, the band partook in the SXSW’s JAPAN NITE US tour, and performed 10 shows in seven cities throughout the country. It was right after the devastating earthquake and tsunami struck the Tohoku region in Japan. The girls’ indescribable emotions expressed through their performance and Japanese songs touched and moved the audience beyond the cultural and language differences. After returning from the US tour, the band went back into the studio to record a single “WE SING ONE VOICE” – the song they performed and treasured throughout the prior year. It was released as single CD and EP in autumn 2012 from ZUKU74RECORDS. On July 17, 2013 released was the much-anticipated third studio album “SING”. Starting from the SOULBOOK on July 14, 2013, the SING tour which covered over 50 gigs throughout the nation in only four months, ended at the Shibuya QUATTRO on November 11, 2013 in Tokyo. The QUATTRO show was the band’s first full performance to add yet another milestone in the girls’ career. The keyboardist 238 exited the group prior to the release of the SING tour DVD in April, 2014. Believing in the power of music, ZUKUNASISTERS keeps on creating compelling melodies and great beats. Real soul music & women’s power at its best yet, ZUKUNASISTERS is bound to be a central figure in the music scene of the new decade.